The 880 and 790 Plus Anniversary Editions still have the gift with purchase valued at $3,600. The #1 gold foot is on sale for $125 (a commemorative piece). The Amanda Murphy Quilt Along on WeAllSew.com starts this month and there is a sweepstakes involved for those who participate. BEST OF ALL - 60 MONTH FINANCING Sept 13-17! 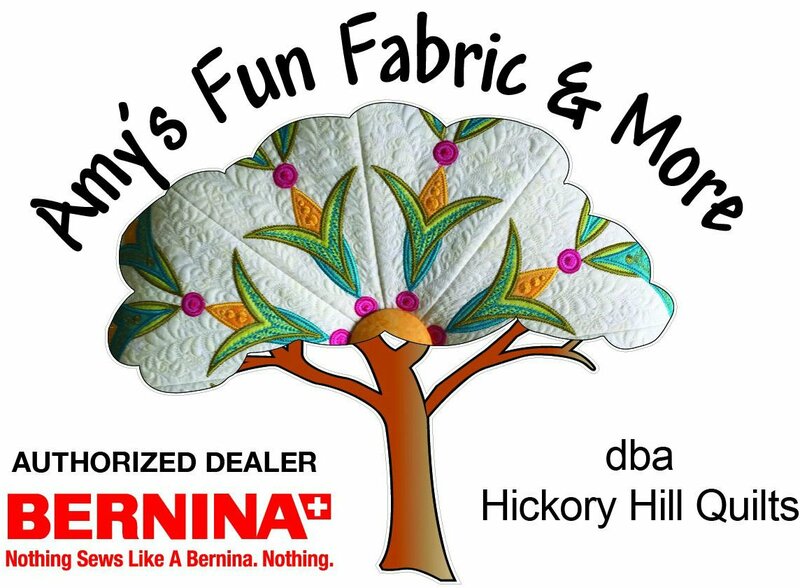 Hickory Hill will continue to honor the trade in trade up pricing for this financing period so that you can get the Bernina of your dreams with affordable payment options. That's an 880 for $209/month! The 790 would be even easier to afford! We have 3 vends this month and want to give our loyal customers a chance to get all the best fabrics before we take them to them on the road! Sooooo - all week this week (9/10 - 9/15) HHQ readers can get all batiks, notions and holiday fabric @ 15% off! Additionally, sale room items get an extra 10% off - so if they are 20%, they go to 30%, etc. Sew Steady/Westalee Specials! For the month of September - Sew Steady/Westalee products are 10% off, in stock and special order! The Large (18"X24") and the Wish Table (22.5"X25.5") sizes ONLY will come with a free travel bag! All other tables sizes (except the Featherweight table) offer the optional Light Stick for only $1 over the price of the table (retail value $29.95), to convert your Sew Steady table into a convenient light table. If you haven't seen the Featherweight table, you need to check it out - it is gorgeous! It is black and gold, made exclusively for the black and gold Featherweight Model 221 (17.75"x22.5"). It too will get 10% off and they are throwing in a travel bag for $30, another $9 savings! Because all tables are specific and laser cut for the machines, they must be pre-paid and are non-refundable. For this reason we ask that you put your orders in writing to info@hhqsewingcenter.com giving us machine make and model and your contact information. Orders will be placed weekly throughout September. New - BINDINGS: Are you unsure of how to apply bindings, or not satisfied with how they look when completed? This is the class for you! Learn how to make perfect, sharp corners, and how to join the ends of your binding so that the finish is invisible. Class meets Thursday, September 20, from 1pm until 3:30pm. This class is for all skill levels. OPEN SEW DAYS W/ POT LUCK! Everyone invited to this fun day of sewing and sharing some fun with friends! When we have more than 10, we give our a door prize! This month it is on Saturday, 9/15 - The theme is Hoagies! Anything to eat with or on a sandwich. The shop will provide sandwich basics (bread/meat/mustard/mayo). Please let us know if you will be joining us so we have a better estimate of food needed! This adorable tree is on our front counter. It has ornaments, garland and pixie lights and is too cute to pass up. It would make a great gift for shut ins and elderly who can't manage a tree any longer. THE POINSETTIA (Quiltworx - Beginner Paper Piecing) with Judy Bowers 10/22 & 10/29. This is a small table topper project that can be round or square and fun for the holidays! We also have a couple of sew days with Judy on the schedule now that she is back in Arkansas! NEXT EDGE TO EDGE - (in the hoop quilting class) is 10/23. Christmas Projects - We are doing samples now of our Christmas Project we hope to offer. Those will be announced in the coming weeks. Stay tuned for some Holiday Fun! Mini Classes - Our mini classes were a success but many had conflicts. We will be adding these back to the schedule as the room opens up. Serger Classes - We will be adding serger projects either in 4Q18 or in 2019 so stay tuned. Bees - Please let us know your 4Q schedule so we can reschedule the classroom if you do not plan to meet at the shop during the holidays. 9/15 Open Sew Pot Luck Day - Hoagies! 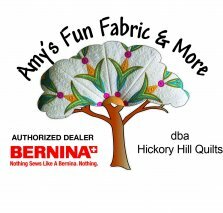 9/21 & 22 Benton Quilt Show - See us there and get a ticket for a discount if you bring a quilter who has never been to the shop! Other News - MACHINE RENTALS!!! You asked for it - you are getting it! We are going to rent our trade in machines! This will save you lugging your heavy machines back and forth from the house. All requests will need to be pre-arranged by calling the shop. Rental will be $15/day regardless of part or all of the day. Right now we have 4 machines we have taken in trade that can be used for rentals. Three are 500 Series and one is a 440. If you have friends needing machines and they want a nice machine with minimal risk, we have used ones we would love to sell. We will give a full year warranty on the machines. We will have them priced and on line in the next two weeks. This is our web page link! In the header, go to the Calendar and you will find the calendar month by month. Underneath it on the right is a printer button. It can be printed! We sell all our collections on line! Batiks and basics are in shop only - mostly.